As regular readers will know, I have been thinking (and writing!) a lot recently about how difficult it can be to know what to read next, how to deal with pressure to keep up with new books, and the importance of going back to our bookshelves. With this in mind, I raided the bookshelves at my mum’s house to see what I could find. My mum has always been a reader, and her shelves are full of a fantastic mixture of old and new titles. 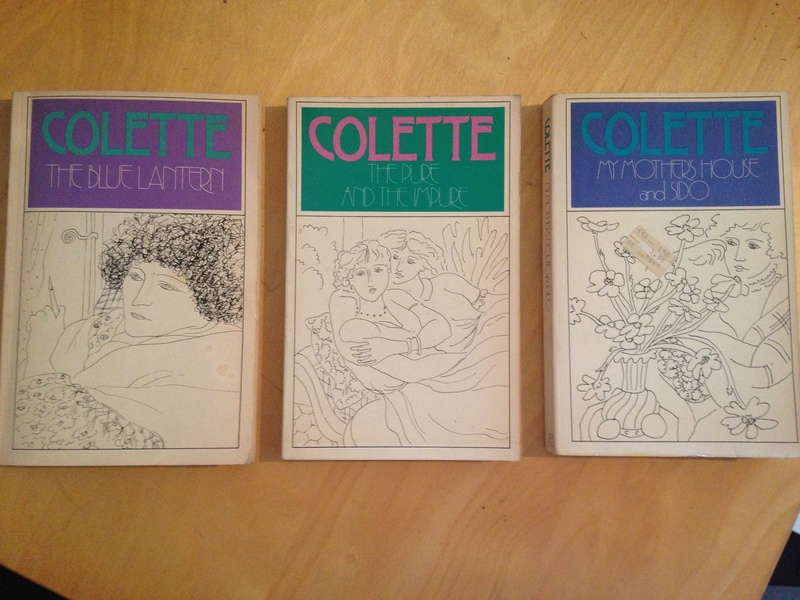 One author that I know she loved when she was younger was the French writer Colette. Colette was hugely famous during her lifetime for her writing and the memorable characters she created, and I think her fame has lasted well over the years. She is best known for her characters Claudine, Gigi, and Cheri, as well as her long and eventful life. I knew I wanted to read something by her, so I persuaded my mum to let me borrow her collection. These three books are American editions, published by Farrar, Strauss & Giroux, that my mum picked up on a trip to the US in 1980. Their publication date is 1979. We should not be unreasonably perturbed when our precious senses become dulled with age. I say “we”, but I am the text of my own sermon. My chief concern is lest I should mistake the true nature of a condition which has come upon me gradually. It can be given a name: it keeps me in a state of vigilance, of uncertainty, ready to accept whatever may fall to my lot. The prospect gives rise to little that is reassuring, but I have no choice. She is certainly not best pleased to be feeling the effects of ageing, but her willingness to accept these changes is admirable. And she has clearly not lost her talent for writing. The Pure and the Impure (centre) contains Colette’s musings on relationships and sexuality. 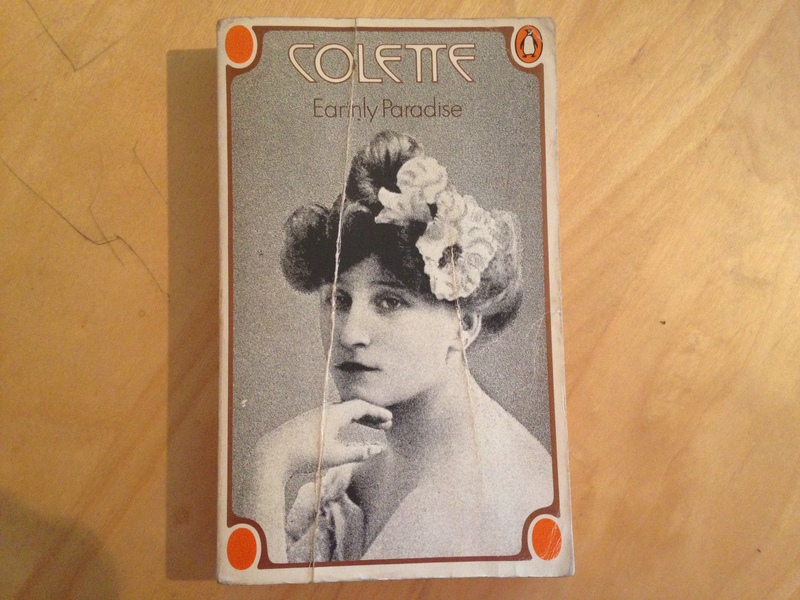 Its original French title was ‘Ces Plaisirs’ – ‘These Pleasures’ – though Colette changed it when it was made into a single volume (having previously been serialised). It is a collection of descriptions, or portraits, of women, some of whom are pure, and some of whom are impure. The ‘pleasures’ of the original title are those “which are lightly called physical”. By this Colette meant that they also stir the soul – her point being that physical or sexual pleasure was not simply a base act but something ‘higher’, almost philosophical. My Mother’s House and Sido (right) are two novels, in one volume, that are highly biographical accounts of Colette’s mother (whose name was Sido – short for Sidonie). She was a huge presence in Colette’s life and she famously said that the “personage” of her mother haunted her long after she had died. I’m very interested to read these and learn more about the mother-daughter relationship, as well as the many different ways a mother can be seen through her daughter’s eyes. 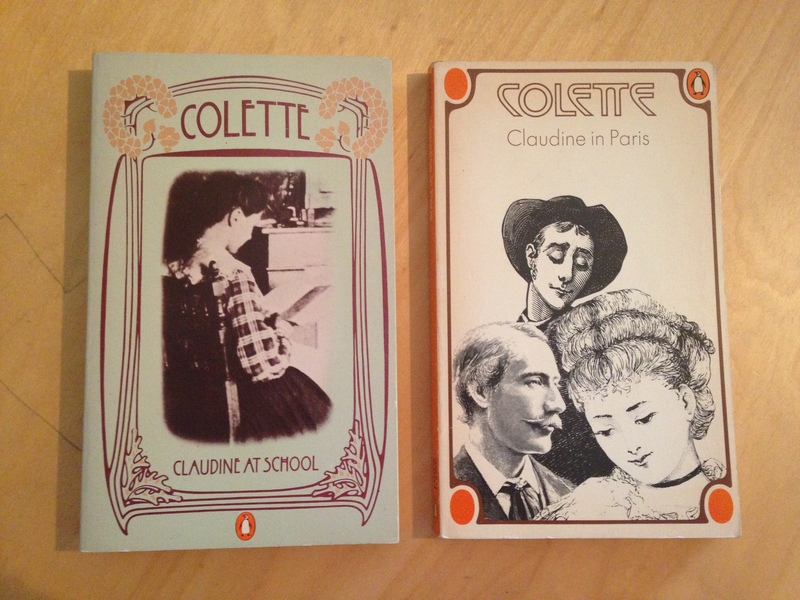 These are two of Colette’s famous Claudine novels. Claudine was one of her most famous characters, a girl working her way through adolescence and into adult life. There are four novels in total, Claudine at School, Claudine in Paris, Claudine Married, and Claudine and Annie. They were published between 1900 and 1903 and have always been very popular, as they cover such a huge range in Claudine’s life – and of course they are beautifully written. They are written in the first person (except the last, which is narrated by Annie), which makes them seem even more intimate and personal, and I suppose the reader must feel very close to Claudine once it has all been read. I’m really looking forward to these. The edition of Claudine at School is dated 1979, and Claudine in Paris is dated 1972 (which explains the different cover styles). This is one of Colette’s most famous works – Cheri. This edition also includes the sequel, The Last of Cheri, which covers the end of his life. The rather racy cover is an image from the 1973 BBC adaptation of Cheri – I think it makes it look a bit like a romance novel. Still, it is not as bad as some of the film and TV tie-in covers you see now! Like most of Colette’s books, Cheri was thought of as quite shocking when it was first published in 1920 – but it was still a huge success. On the back cover of this edition the novel is described as a “portrait of [a] spoilt, capricious youth, as handsome as the devil, and of the talented woman who devotes six years to his amorous education” – which to be fair does sound a bit naughty. It was adapted again, this time into a film, in 2009 and starred Michelle Pfeiffer and Rupert Friend. I’ve not seen it, and it’s only got two and a half stars on Rotten Tomatoes – so not sure if it’s worth seeing. I’m still looking forward to reading the book though. Lastly, this is a well-worn 1974 edition of Earthly Paradise, a collection of her memoirs, notes, and letters that makes up a sort of autobiography. It includes some sections from The Blue Lantern, as well as Sido, and The Pure and the Impure. The extracts are arranged in order to cover her life chronologically, and a quote from The Times on the back cover states that “For lovers of Colette there will be no better book … for those who do not know her, there will be no better introduction.” For this reason I am going to read this book before any of the other books I have mentioned here. I also love the cover with its portrait of Colette, and the fact that my mum has taped it up on the inside to stop the creases from tearing (sellotape from the 70s!). Aside from these being great books to read it is also wonderful to look at these old Penguins, and think of my mum reading them when she was in her twenties. The Penguins are also quite small, which I love, as that was the point of them in the beginning – to be cheap, convenient paperbacks. Indeed, none of the prices on them are over a pound – something that is unimaginable now. I’ll keep you updated with my reading of Colette, though I can’t promise anything very quickly I’m afraid. Have you read anything or want to read anything by Colette? Don’t you just love these old books! 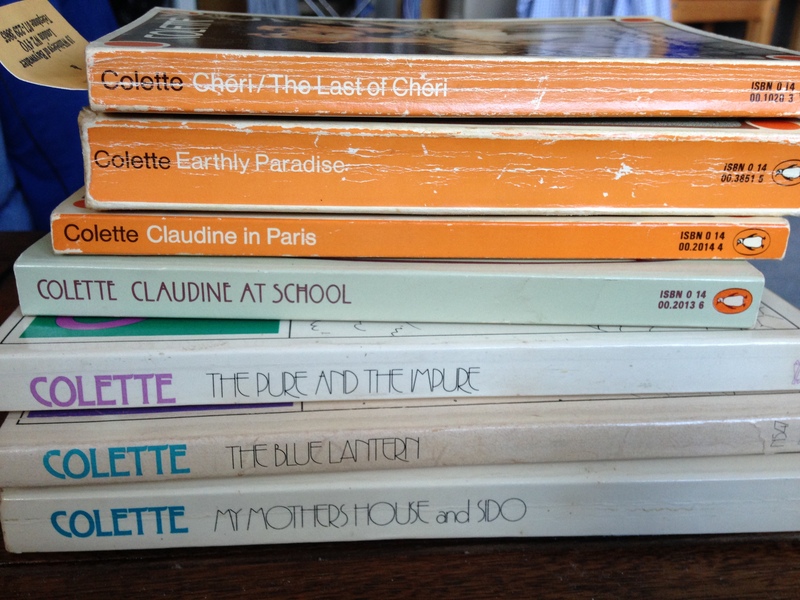 I’ve got the same edition of Claudine at School – and a few more of the Claudine series in the same format. I love Colette – and My Mother’s House/Sido is a beautiful memoir of childhood. The stories about her mother just look like they’ll be fantastic – can’t wait to read! What a lovely collection of books! I love that you’ve borrowed them from your mum, and all the memories associated with these editions. 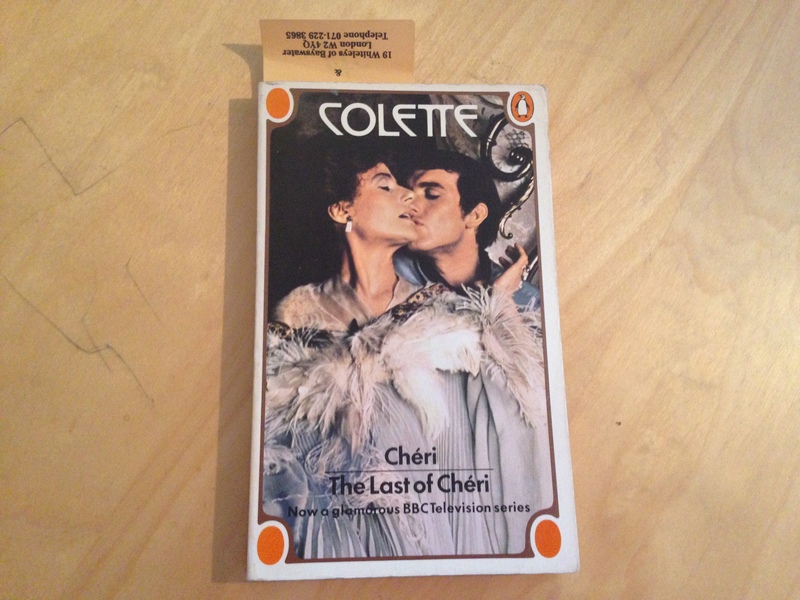 I haven’t read anything by Colette (not yet, anyhow), but ‘Cheri’ is the one I’ve had my eye on. I look forward to hearing more about how you find them. Yes, I love the fact they are my mum’s too. When I was getting them out of the shelves I was asking her what they were about, and she was telling me about when she read and where she was etc. I love the history attached to old books. Aren’t they? And they’ve got a lovely old books smell that makes me think of libraries. They’re on my table at home and I can’t stop looking at them! Thank you Gemma, that’s great to hear. Would love to hear what you think of any Colette you read as well. A brilliant collection! So far I’ve only read Gigi and The Cat. I loved both, but was particularly impressed with Colette’s descriptions of Saha, the cat in her novella. A must for any cat lover! I should really make an effort to read some more of Colette’s work. Thank you! I’m really looking forward to reading these. Thank you Alice. It’s so nice hearing that people have read Colette. Now I just need to get cracking in these! I agree the FSG covers are lovely – they’re also quite pleasingly sturdy, where the Penguins sometimes feel a bit flimsy. I love them all though.